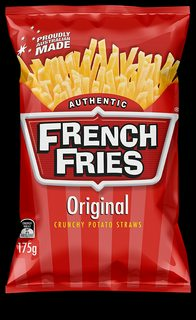 I am looking for a term commonly used to describe chips (BrE)/fries (AmE) that are no longer crispy, and need to be re-fried to give them back their crispiness and proper taste. It should be quite a simple word to find, but I cannot find one. BrE Chips = AmE Fries and they will become soggy (lose their outer crunch from moisture escaping the inner part) and eventually dry out (not sure there is a word for that though, I would probably not say "dessicated fries") Frying them again will bring back some crunch as a outer layer of the chip / fry has moisture removed to make it crunchy/ crispy. Generally speaking a Crisp/Chip is a packaged food sold in a store and eaten cold whereas a Chip/Fry is a fresh food served hot and eaten immediately. In American English it would be illogical for a Chip (crisp) to be soggy since a few hours time has no effect. The only exception would be if water were poured into a bag of chips (crisps.) Likewise it would be illogical in American English to refer to a fry (chip) as stale because it is eaten fresh and would never be left long enough to undergo becoming stale (assuming it was a tasty fry/chip.) The only exception might be if the potato it was made from was too old but then the term would more likely be rancid or rotten than stale. In Australian dialects and creoles, the terms are much muddled and therefore it is hard to predict how speakers of those dialects would describe this situation. I'd use stale. It may be particular to my region maybe. "Soggy" fries are cooked at the wrong temperature, and absorbed too much oil. "Stale" fries are old and not crispy anymore. I've never, ever referred to chips/crisps as "soggy"; they are always "stale". Usually they go stale from exposure to moisture, and I bake them for 5 minutes at about 200F to fix them. "Soggy" also refers to cereal that's been sitting in the milk too long. American here in the Midwest part of the country. I don't think I've ever heard someone refer to french fries as stale unless they had been left in a freezer too long before frying or baking. Soggy would be fine and well understood, but the most common way I hear this described is limp or cold. Australian weighing in. We use all the names. Crisps are the bagged thin-sliced (often corrugated) 'wafers' eaten at room temperature (not cold, you don't put crisps in the fridge) and are usually called chips. Fries are the hot 'sticks' of potato that come in a cup (or wrapped in paper with fish) and get dowsed in salt & vinegar and are also usually called chips. To remove ambiguity we usually say 'hot chips or crisps'? that's right, french fry crisps. Crisps go stale, fries go soggy (especially if dowsed in vinegar). However, we're Australian and stale is generically near enough to soggy to allow us to call old fries stale. Crisps however don't get called soggy if they're just stale, though they can get soggy if left out in high humidity areas. You could say the chips/fries have gone limp, once they are cold and no longer crunchy. As others have mentioned "Soggy" works as well. Being a Brit and having suffered this somewhat nauseating effect when visiting some "Fish & Chip Shops" and other fast food outlets such as "Fentucky Cried Khicken", around the UK, the most adequate word I can find that would describe Fries/Chips that had lost their crispiness is "Mushy". Once the (french) fries are cold, Americans agree they won't be good. Most Americans will warn you they are "cold," unless they have been sitting there for a long time (hours or days) in which case they might tell you they are "old." A Brit I know once inquired about the specific condition of cold fries. The Americans were puzzled - only grandma tries to "toast up" the fries, younger Americans consider them garbage. A (GB-EN) chip which is already crisp is unlikely to lose its crispness. A cooked oven chip, colonial style french fry, home fried potato chip or a 'fish and chip shop' style chip does not lose its consistency when left. A plate of them anywhere in the British Isles would simply be referred to as a plate of cold chips. I suspect refrying them is a more Northern England practice but I am happy to be corrected on this point. Beyond the point of ediblity I would expect them to be referred to as old chips or stale chips at a pinch. I suppose this is a 'chiming in" answer however in colloquial american English I think 'stale' strongly suggests that something is close to irreparably inedible ... something you left in the refrigerator and came back to to eat but no longer could enjoyably. Pizza left a few hours might be "cold" (another possible answer here) as could fries - and cold fries are generally not crisp (well certain brands might retain that outer shell). If however, the fries were sitting in a warm food storage case at a fast food place I think the complaint would neither be 'stale' nor 'soggy' .. the first implying perhaps a day old and soggy implying incorrectly prepared or mistreated beyond time. Also.. side point ... I don't think you can 'revive' french fries that aren't fresh .. you might reheat them, but that won't cure their lack of freshness. I have a British friend who always orders French fries or bacon by saying he wants them "rigid" not "floppy". I think floppy is a good description of fries that are no longer crisp or "rigid". "...fries (AmE) that are no longer crispy, and need to be re-fried to give them back their crispiness and proper taste..."
"It should be quite a simple word to find..."
Not the answer you're looking for? Browse other questions tagged single-word-requests food or ask your own question. What is a non-pejorative antonym for gourmet? What is an adjective for a group of people who have already been convinced of something? For native speakers, what are dumplings?